Gandhi Study Circle of Gargi College an organised Intra-college Poster Making and Slogan Writing Competitions on 27th September, 2013. More than twenty students from different subjects participated in these competitions. The topics for Poster Making Competition were: a) Gandhi & Morality; b) Gandhi & Self-education; and c) Gandhi and Environment. The winners are as follows 1st prize-Ishu Sharma, English (Hons. ); 2nd prize Vartika Garg, Maths (Hons. ); and 3rd prize Amandeer Kaur Dhanda, Physics (Hons.). The topic for the Slogan Writing Competition was Gandhi & Women. The winner were: 1st prize - Megha, Hindi (Hons. ); 2nd prize – Kumari Archana, English (Hons. ); and 3rd prize – Amrita Dayal, Political Science (Hons.). The Study Circle also organised a talk on “Gandhi’s Integrity: Reconstructing Gandhi’s Moral Insights” on 5th March, 2014. Dr. Bindu Puri, Associate Professor, Department of Philosophy, University of Delhi, delivered the talk. In her presentation, Dr. Puri elaborated the aspect of morality in Gandhian Philosophy and traced the foundation of Gandhian Morality in Patanjali’s Philosophy. She also described the ideas of Gandhi on Swaraj and argued that Gandhian Swaraj is more about self-control and less about self-rule. She further spoke on the role of religion and non-violence in Gandhian ideal state i.e. Swaraj. The Study Circle had its Annual Fest on 25th March, 2014. The fest comprised of a talk on “What is Gandhi?” which was delivered by Professor Bidyut Chakravarty, Department of Political Science, University of Delhi.Prof Chakravarty bringing a fresh perspective on Gandhi highlighted his liberal commitments. According to Prof Chakravarty, Gandhi was influenced by British liberalism along with several individuals. These influences together made Gandhi relentlessly fighting for freedom and equality of individuals. In Debate Competition, Best team prize went to Mir Fatimah Kanth and Shruti Narayan of Gargi College, second best team prize went to Rajni and Abhishek of PGDAV Morning College, Best Speaker prize was shared by Mir Fatimah Kanth of Gargi College and Nafroz of Miranda House. The best Interjector prize went to Nafroz of Miranda House. In Poster Making Competition Kunal Singh of Saheed Bhagat Singh (Eve) College, Rashika Sood of Gargi College and Shabnam of Gargi College, got the first, second and third prize respectively. In slogan making Competition the first, second and third prize went to Mary Chakravarty of Zakir Hussain (Eve) College, Archana and Megha of Gargi College respectively. Inter-college events like Debate, Poster Making and Slogan Writing competitions were organised as part of the fest. 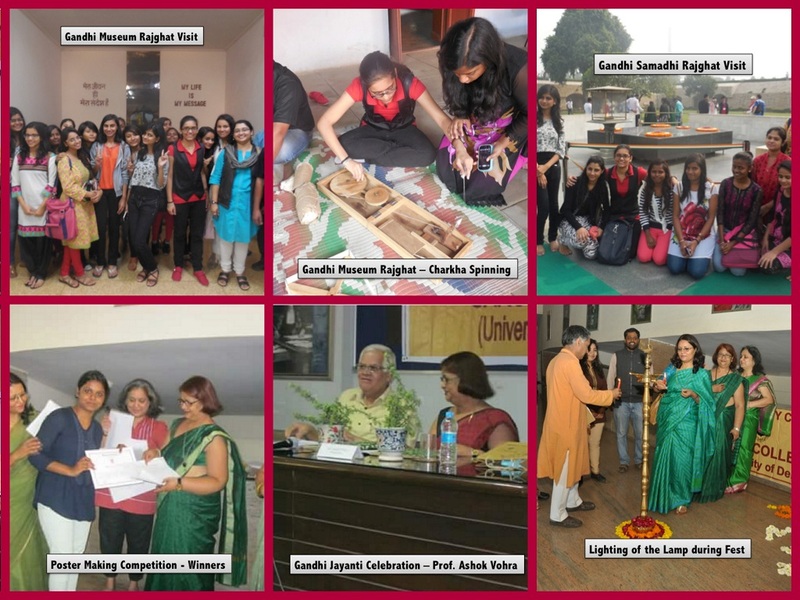 All these events had a good participation of students from various colleges of Delhi University.